You are here: Home / Website Basics / I or We? You’re a solo business trying to sound legit. Do you use “I” or “We” in your website and blog text? When I opened my first business, the massage practice, it was a mix. I had originally thought there would be more therapists coming on board, so I hedged my bets. When I wrote the initial text for this website, there was an awful lot of “we” scattered around. Using “We” when there is only an “I” is a mistake. It’s not authentic, it’s not true, and it makes us look stuffy and pretentious. Not the best way to get a business relationship off the ground. As I’ve updated and tidied up the site, I’ve been killing those “We” bugs where I find them. Oh, you might still find one hiding away somewhere. If you do, I’d appreciate a quick note telling me where it is so I can go squash it. But, by and large, it’s all about the “Me” around here. Killing off my old corporate alter-ego, I call her “Corporate Kelli,” has been a struggle for me and I’ll bet it has been the same for you, too. We’re taught early on to sound “professional” and “inclusive” and “unoffensive” in our business lives. We’re taught to write from the company’s view and that means “We”, like we’re a part of the Borg collective. You will be assimilated, resistance is futile. Right. This is YOUR gig, baby. Those drones sitting in their look-alike cubicles, all wearing the same light blue shirt and khaki pants on casual Friday, wish they could break free and do their thing. So why are you channeling your corporate voice? The people who want to do business with you want to do business with YOU, not Seven-of-Nine, so quit with the “We” crap already and wear that “I” like you were born to it. Because you were. Using “I” is hard. It means putting yourself out there. Making yourself the target of criticism. Making yourself vulnerable. In reality, though, using “We” is like putting a towel over your head and pretending that no one can see you because you can’t see them. Of course they can. Getting out from behind that verbal trick is scary. It takes practice. It can take some coaching. I’m lucky to have a couple of friends who have pushed nudged me and supported me as I step farther away from “Corporate Kelli”. When you talk to your friends, do you sound like a corporate marketing department? No. You sound like you. You are a real life, flesh and blood person that your customers are doing business with. Want a good place to start? Go to your “About Me” page. If it’s written in the 3rd person, grab a hot beverage, sit down for 30 minutes and write it as if you were talking to your friends. Already have a great “About Me” page? Then I want you to write a blog post. Write it as if you were writing a letter to a friend. 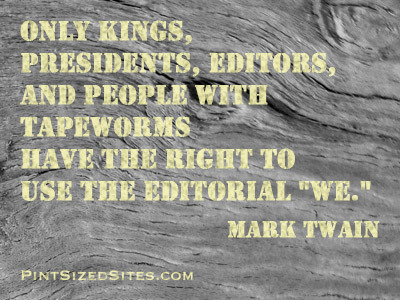 You’re not a King or a President, and I’m betting you don’t have a tapeworm, so lose the Editorial “We”. Check out the free 10 Part Tutorial that Dawn Barclay and I put together on Business Blogging School, it’s called How to Knock Blogging Fears on The Head. 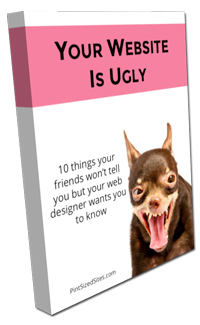 However you can easily apply the lessons to all areas of your business website not just your blog, because the fears are universal!